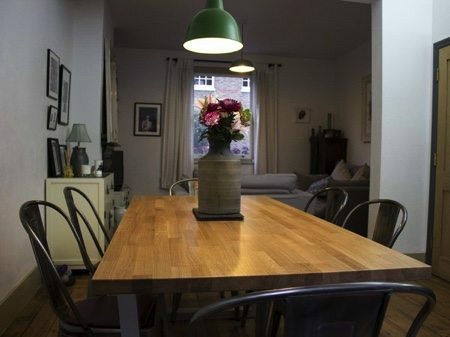 Home > Blog > table finish > Which Table Finish is The Best? 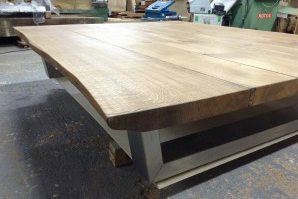 One of the most frequently asked questions I get is about the finish of our tables. How resistant to staining is it? How long does it last? In other words – how long will my table look nice for and how much of a pain will it be to maintain? Ever since I made that very first table (that’s in my living room right now), we’ve been on a quest to find the holy grail of table finishes: one that keeps a table looking like new permanently without any maintenance. 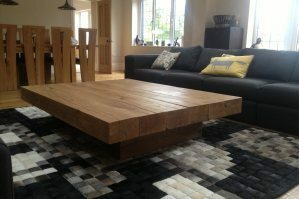 To John and I, the entire point of using big beautiful pieces of oak to make a table was to exhibit their natural beauty. 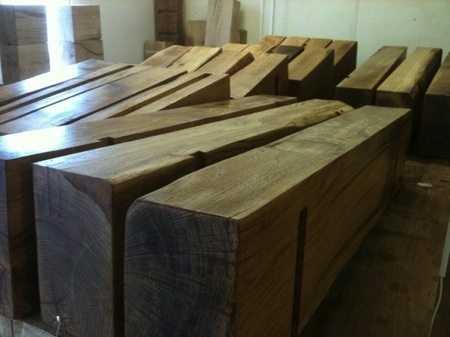 So our main criteria was always that the table’s finish must keep the oak’s natural look and feel. 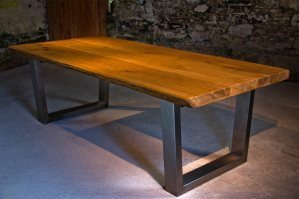 So for the first few months we finished our tables in linseed oil, which gave the oak a gorgeous rich colour and kept that natural look and textured feel. But we quickly realised that it gave little protection against staining. We quickly moved on to a cellulose sealant, with a wax over the top. This combination meant we could offer different colour finished for the first time and we decided on a clear natural finish and a dark oak finish, to really bring out the character of the oak. Those two simple options have remained our standard colour choice. But for the extra protection against staining that the sealant and wax combination of finishes offered, we had new problems. Firstly a wax is just a wax, which means it goes soft and rubs away easily, so a table needed to be re-coated by the owner every few weeks to maintain the lovely new look of the table. Wax, as it turns out, is a high-maintenance finish. Secondly, the tables still weren’t very well protected against staining, so cup marks were still major problem. To remove these marks meant sanding away the hard cellulose finish and then re-applying it, to blend in with the existing finish. Not only was this quite difficult for a non-woodworking table owner, but we also had to wear masks and have lots of ventilation to apply the sealant as it was pretty stinky stuff. The compromise just wasn’t worth it. So we’d improved the stain protection slightly and were now able to offer different colour finishes, but in return we had a very high-maintenance finish that really needed professional repair to remove any stains or marks. Almost every week we were testing different products and talking to manufacturers to try to improve on what we had. We knew there was an option we’d been ignoring. When you go into almost any furniture shop, the majority of tables you see are finished with a lacquer. This is a clear, hard coating that gives wood an artificially smooth plastic look and feel. But we tracked down a company to do some testing for us and decided on a very matt lacquer to minimise the shine of the finish and hopefully keep the wood looking as natural as possible. What we hoped was that the lacquer would be so stain resistant and durable that we could stand a slightly less natural look to the wood. What we found was that the lacquer did, as expected, protect better against staining (such as household grease, wine, hot cups etc.) than our sealant-wax combination. But it still marked and that uncovered an even bigger problem with lacquer – although it’s extremely durable, it’s almost impossible to remove a stain in lacquer, especially for a non-professional, and also that lacquer scratches quite easily too. The result of using a lacquered finish means a table will gradually get more and more shabby as the stains and scratches build up and before long, a heavily used table will look old and scruffy. 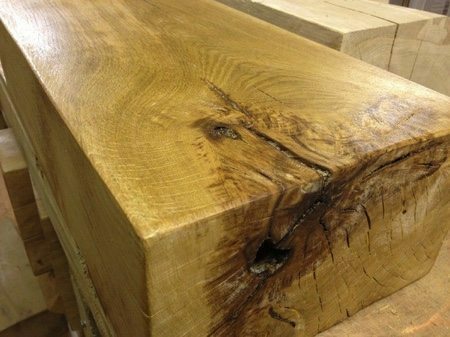 So we’d found a natural oiled finish, but it gave very little protection from stains. We’d found a slightly better protecting sealant and wax finish that was high maintenance and needed professional restoration to remove stains. And we’d found a lacquer finish with gave the best stain protection but made the table look and feel like plastic and would collect marks and scratches until it looked shabby and, due to the cost of repair, needed replacing. Then we found something that beat them all. The finish we still haven’t beaten to this day. Designed for solid oak flooring, Hard Wax Oil is very durable (in other words it only needs to be refreshed once a year), it gives a better level of stain protection than the oil and wax combinations we’d tried, it’s very user-friendly to remove any marks that do find their way into it and it keeps the oak looking and feeling beautifully natural (as I’m sure you’ll agree from the Komodo photo below). The result is that a table with a hard wax oil finish can quite easily be kept looking like new by the table owner, pretty much indefinitely. 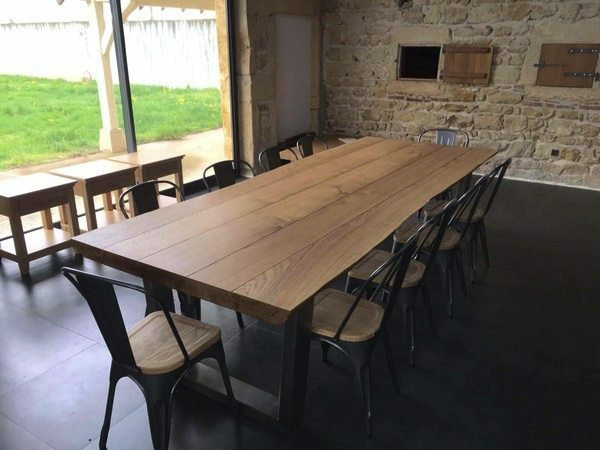 It isn’t the perfect finish and our quest continues to find it, but for anyone who wants to be able to keep their table looking like new with the minimum maintenance, a hard wax oil finish allows them to do it and that’s why we use it.